Catholic communities are, by their very nature, intergenerational. Our membership, liturgical celebrations and Sacramental moments bring together generations of family members as the faith is passed on from oldest to youngest. Family workshops, like CMN’s “The Advent of Mercy,” make this intergenerational character a defining feature, incorporating various age groups in a hands-on learning process designed to engage all members of the family unit. Starting with the premise that the faith is passed on initially and primarily within the family unit, these workshops engage adults in learning or reinforcing their own knowledge of the faith so they communicate the faith through word and deed with children. The second focus is on providing children with engaging age appropriate activities which provide them with the language and experiences of our faith tradition. Lastly, our intergenerational workshops emphasize opportunities to take materials and projects home to continue the learning process as a family throughout a given season or timeframe. According to Mariam-Webster “Advent” is a word that denotes the arrival of a notable person, thing or event. It is also marks the start of a new liturgical year in the Roman Catholic Tradition. For centuries the Season of Advent has been a time of preparation, anticipation and waiting for the incarnation of God-made-Man. This intergenerational family workshop is intended to help communities and families journey through the Advent Season with a special emphasis on the call to mercy as embodied by the person of Jesus Christ who we prepare to welcome. This one to two hour family workshop provides an opportunity for families to gather as part of the parish community to reflect on our call to be people of mercy and to provide families concrete opportunities during the Advent Season to pray for and practice mercy as a family unit. 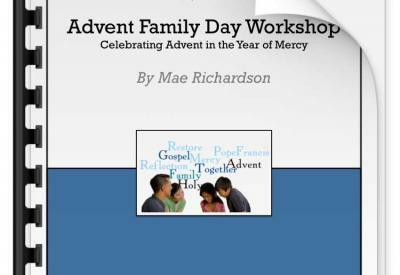 Please register to receive a copy of the Intergenerational Workshop "The Advent of Mercy". Your download will begin automatically after registration.